Known best for his sculpture and performance works, artist Ken Unsworth has had a long, outstanding career in Australia and internationally. Suspension, levitation and the possibility of transcendence, suggested in ways that are magical and illusory, have been constant themes in his work, as has the denial of this possibility. His recent performances – in which he works closely with dancers, musicians and technicians – are highly dramatic, incorporating complex personal narratives and staging. He is currently rehearsing a new work at his studio/performance space, during which the sittings for this painting took place. A long-time admirer, Mathew Lynn only recently met Unsworth. This took place in the rainforest below Katoomba at the unveiling of Unsworth’s sculpture Harlequin’s shuttle , commissioned in conjunction with the 2014 Scenic World Sculpture Award. The combination of seeing this work, which Lynn describes as ‘miraculous’, and their meeting, had a great effect on him. Lynn refers to Fragonard’s famous Rococo painting (with a further reference to Morandi’s flowers) as a way of suggesting Unsworth’s playfulness, mischief and sense of the dramatic. These sources are re-formed into a narrative that is implied through Unsworth’s body and face with its accumulation of a life, loaded with restrained energy, yet surging with precarious possibility and mortality. 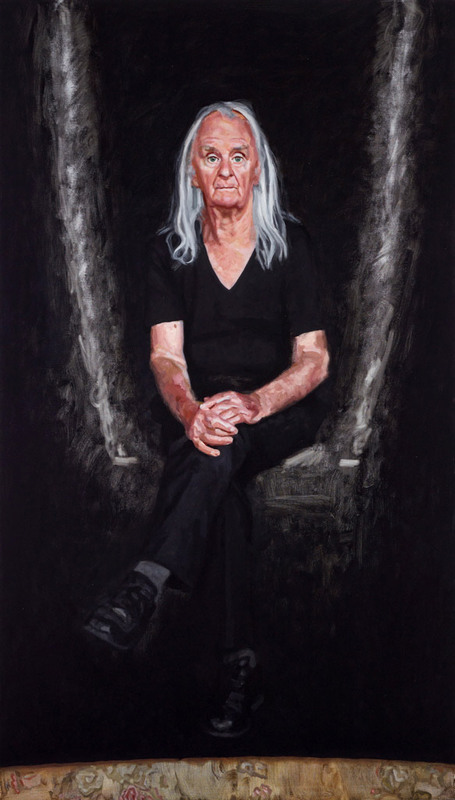 Born in Sydney in 1963, Lynn has been an Archibald Prize finalist 14 times. He has twice been named runner-up, once People’s Choice, and won the Packing Room Prize in 2013.